This is the ford across the River Kenwyn at New Mill, near Truro in the English county of Cornwall. 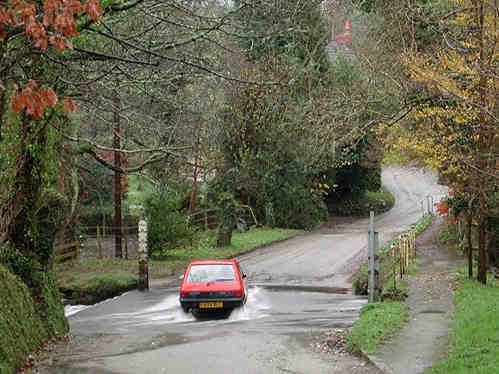 I remember small river and stream crossings like this, but little did I realise just how many remain in use: WetRoads.co.uk lists 33 such fords in the county of Cornwall alone, and has a directory to the remainder of the UK. The Wet Roads listing for New Mill and the crossing of the River Kenwyn links to another picture taken by Charles Winpenny back in October 1999.